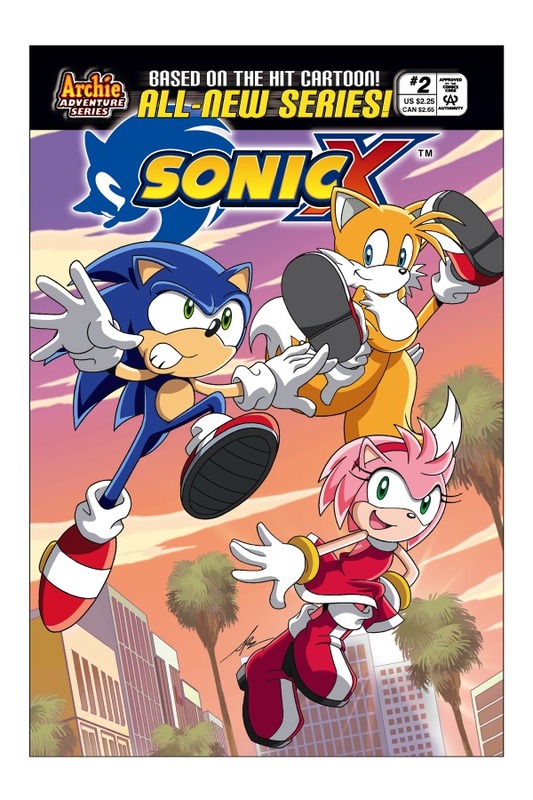 C’est à Newsarama qu’Archie Comic a en premier fait découvrir les nouvelles couvertures, et même pages de la naissante série Sonic X dont nous vous parlions dans la dernière news. Celle-ci est prévue pour le 7 septembre (voir source), soit 2 semaines plus tôt que ce que nous pensions, et au prix de 2.25 $US. Elle devrait demeurer une série permanente, publiée chaque mois sur papier style ’glacé’. Mais passons tout de suite à ce qui vous interesse le plus : les images ! SONIC speedsters are salivating for the stupendous new SONIC X four issue mini-series ! 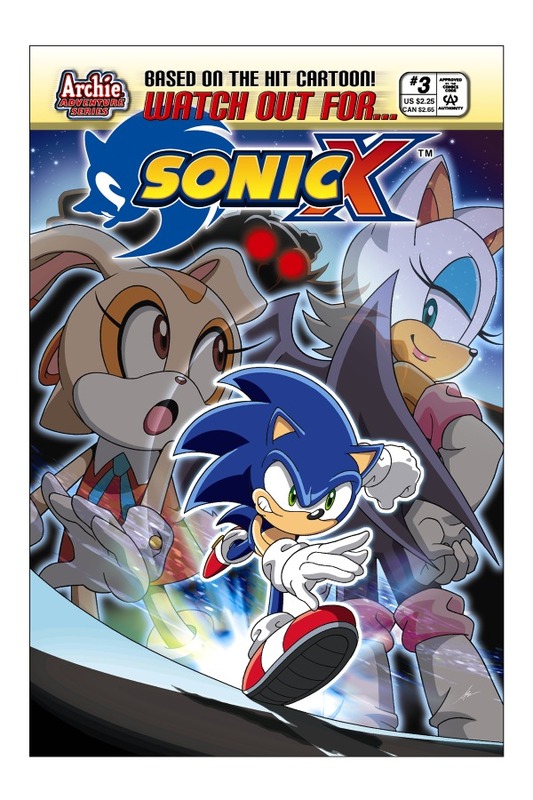 All new stories based on the storylines from the hit Saturday morning cartoon SONIC X and featuring all the most popular characters ; SONIC along with KNUCKLES, TAILS, AMY, CREAM and CHEESE, ROUGE, CHRIS, TOPAZ and even an appearance by the mysterious SHADOW as well as many more. Things go to the X-treme when SONIC and friends are transplanted and trapped on Earth. With the diabolical DR EGGMAN planning to conquer the planet with his maniacal mechanical robot menaces ! Our heroes set off to protect the Earth from EGGMAN and find a way back to their home world. 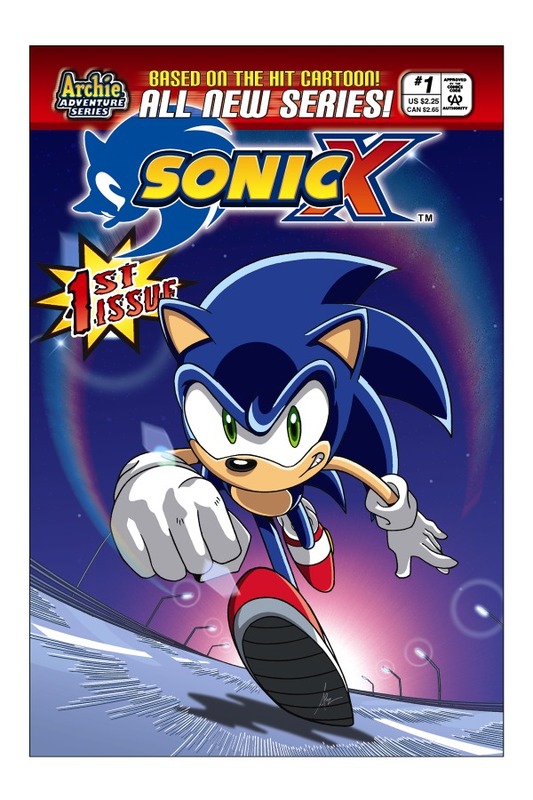 Each full length SONIC X story is great for first time or long time loyal readers and is perfectly crafted for each issue to stand alone or enjoy the building action over the entire fun filled 4 issues ! SONIC X starts off with a boom ! When an evil plot by EGGMAN, with sidekicks DECOE and BOCOE putt hundreds in danger attempting to empty the bank vault of all its cash, DR. EGGMAN hopes to gain more bucks for bigger, badder ‘bots ! Trapped in the bank are SONIC’s friend Chris and his family ! Only SONIC can save the day with help from KNUCKLES, AMY, CHEESE AND TAILS ! Things go from bad to worse when a strange energy is threatening the entire seaboard, is it a Chaos Emerald ? Or is it something much more dangerous ? Worst of all the mystery is at the bottom of the ocean, and SONIC can¹t swim ! SONIC X is written by Joe Edkin, who is familiar with fun and speed with popular writing stints on Scooby Doo, and cartoon line and resident speedster from the Avengers and X-Men, Quicksilver. Handling the artwork will be Tim Smith 3, who is no stranger to teen drama and adventure with popular artwork on Teen Titans Go ! Andrew Pepoy brings his versatile inking style over to SONIC X, a long time SONIC THE HEDGEHOG inker as well as stints on G.I. Joe, Betty and Veronica, Manga Josie and the Pussycats, Robin and just about everything else. Most famous for his fabulous run on Voltron, Ben Hunzeker rounds out the SONIC X staff and lends his color hues to the Blue Blur. Last but not least SPAZ (Patrick Spaziante) fan favorite cover artist for SONIC THE HEDGEHOG does double duty with covers for SONIC X. As one of the most versatile and popular artist and a SONIC fan favorite for years with stints on Megaman, Muties, video game magazine cover artist and accomplished book illustrator is sure to X-cite old and new SONIC fans alike ! SONIC X is great for new and all age readers. At a cover price of $2.25us/$2.65can and printed on coated stock paper SONIC X looks better than ever !